A first aid kit is an important tool to help you respond to both everyday accidents and injuries, as well as emergency situations. A first aid kit should contain basic medical supplies to prepare you for any emergency. You can purchase a first aid kit (like this on on Amazon), but putting together your own has several advantages. For one, it can be less expensive since you probably have a lot of the supplies on hand already. Additionally, even if you purchase a basic first aid kit, you’ll want to personalize it and include supplies specific to your family’s needs. And third, it’s a lot easier to make sure everything in your kit is within its expiration date when you’ve assembled it yourself. 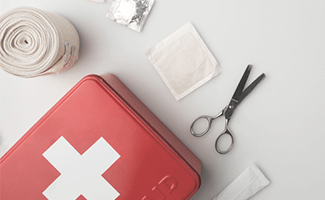 We’ve compiled a list of everything a first aid kit should have, for both everyday and unusual occurrences, along with tips for customizing your kit for your family. 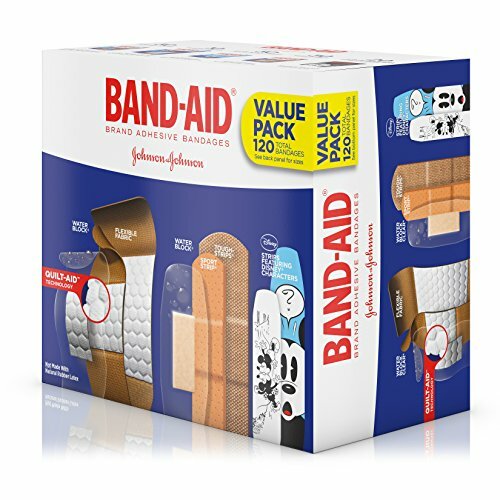 Bandages are your go-to fixes for many types of injuries, so you’ll want to keep a variety of bandages on hand. Include sterile gauze pads, rolled bandages, absorbent compresses (look for hemostatic or blood-stopping gauze), triangular bandages, and adhesive bandages in a variety of shapes, sizes, and types. You could also include liquid bandage or consider adding a compound tincture of benzoin to help bandages stick better. We also recommend having an elastic bandage and material to create a splint on hand. For a truly comprehensive kit, add sterile eye dressings in case of eye injuries. When treating an injury, it’s paramount that you keep both the wound and your hands clean and sanitary. To that end, include several antiseptic wipe packets and triple-antibiotic ointment in an easy-to-find location in your first aid kit. 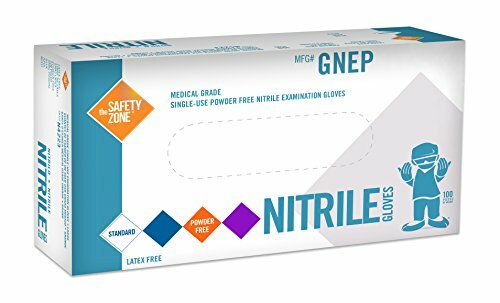 Have hand sanitizer on hand, as well as several pairs of nonlatex gloves. Whenever possible, have access to distilled water to wash out wounds. Medications for symptom relief, like the types you keep on hand at home, are also great to have in your first aid kit. Include over-the-counter drugs such as aspirin, ibuprofen, nasal decongestant, antihistamine tablets, and cough medicine. Additionally, be sure to have burn ointment for minor burns and hydrocortisone ointment for rashes and skin irritation. We also recommend this pain-relieving spray for quick relief from minor injuries. Be sure to stock all the necessary tools in your first aid kit. The last thing you want in an emergency is to have the needed materials but none of the necessary tools to use them. That includes scissors for cutting gauze, tweezers for removing splinters, and cotton balls or cotton-tipped swabs, in addition to safety pins and some kind of medical or cloth tape for securing the bandages. Be sure to have a digital thermometer (absolutely no glass or mercury thermometers) and an assortment of plastic bags to safely dispose of used materials. We also recommend having a pocket flashlight and even a mini magnifying glass to help you treat small wounds. For an emergency first aid kit (like the one in your 72-hour kit), include a CPR breathing barrier, a heat-reflecting blanket, and at least one instant cold compress. And all first aid kits, regardless of where they are kept, should include a first aid instruction booklet. Beyond the basics of a first aid kit, consider what medicines or supplies your family uses on a regular basis. For example, if someone has hypoglycemia, frequent heartburn, or extremely dry skin, include the items they regularly use to treat those conditions. If anyone in your family depends on a medication or prescription, you should definitely have some in your emergency first aid kit. That includes an epinephrine autoinjector for extreme allergies. Have a list of emergency phone numbers and a copy of your family’s vaccination records, if possible. If you have infants or young children, you need to include some age-specific items in your first aid kits. 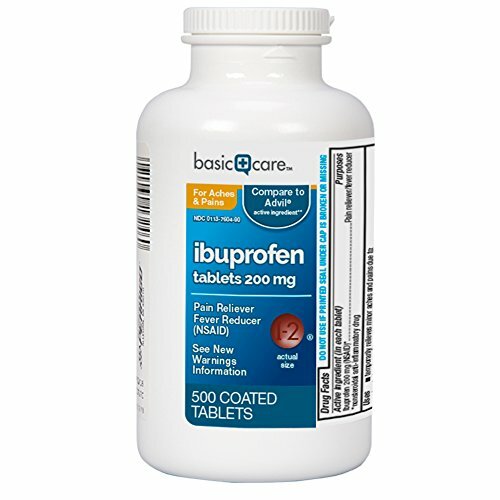 Baby acetaminophen or ibuprofen is essential, as is something to administer the medicine with (like a medicine dropper or oral syringe). Be sure to have small adhesive bandages that will fit around tiny fingers. If you really want to be prepared for everything, you could also add a tooth preservation kit in case someone loses a permanent tooth. 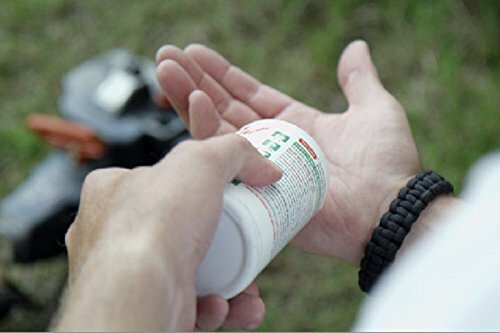 If you frequently spend time outdoors hiking or camping, or if you live in an area that is more nature than city, your first aid kit should have some additional items. Include sunscreen, aloe vera gel, and lip balm to stay protected from the sun. You’ll also want insect repellent and a cream to relieve bites and stings. Add blister treatments, such as moleskin, to your bandages and poison ivy and poison oak treatments, especially if those plants are common in your area. A bee sting and snake bite kit is also extremely helpful if the need arises. For camping or hiking trips, consider the terrain when you pack your first aid kit. 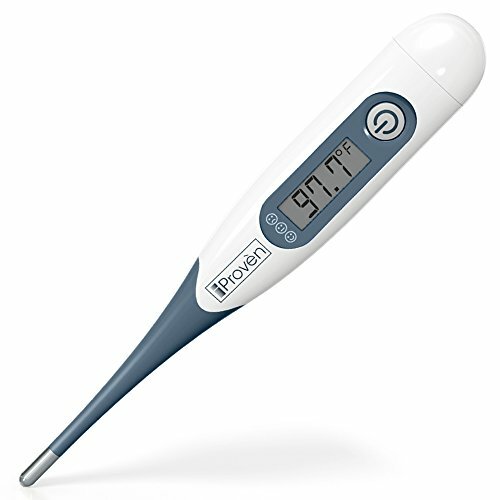 If you know you’ll be in extreme temperatures, add electrolyte replacement solutions for dehydration and a low-reading (hypothermia) thermometer for extreme cold. Many outdoor enthusiasts also recommend having a small knife and waterproof matches with you. And of course, all of this should be held in a water-resistant container. 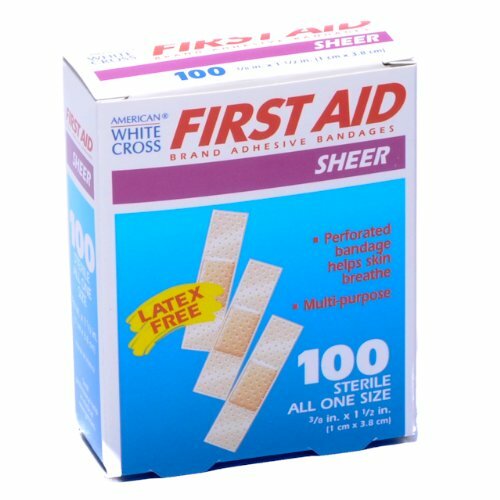 How many first aid kits should I have? You should have at least one first aid kit in your home and one in each car. If you own other vehicles, such as a boat or an RV, be sure to have a first aid kit for those as well. A first aid kit should also be part of an emergency 72-hour kit. Because a first aid kit’s primary purpose is to provide needed supplies in case of minor injuries or accidents, it is important to have one—even a pared-down one of just the essentials in a purse or backpack—on hand anywhere you go. At home, keep your first aid kit someplace easy to access but out of the reach of young children. Make sure all adults, older children, and even regular guests (like grandparents) know where to find it. Ideally, a first aid kit container will have compartments to keep everything organized and easy to find, but it could be just about anything from a gallon-sized zip-top bag to a tackle box to several bins on a shelf in your closet. For an emergency kit, the key is to keep it as compact as possible. The kit that you use regularly in your home can be larger or more spread out. While it’s tempting to put everything you could ever need in a first aid kit, remember that its primary purpose is to treat minor injuries and wounds. Think about your family’s specific needs. Do you have babies or young children? Adults who require extra care? Does anyone in your family rely on medication? How often do you go camping or out into the wild? These questions will help guide you as you prepare and pack your first aid kits. Remember to regularly check your kits to make sure medicines are not past their expiration dates. Always wash and sterilize all equipment after every use (tweezers, thermometers, scissors, etc.). And once you have put together your first aid kits, know that you are prepared to use them in any situation. 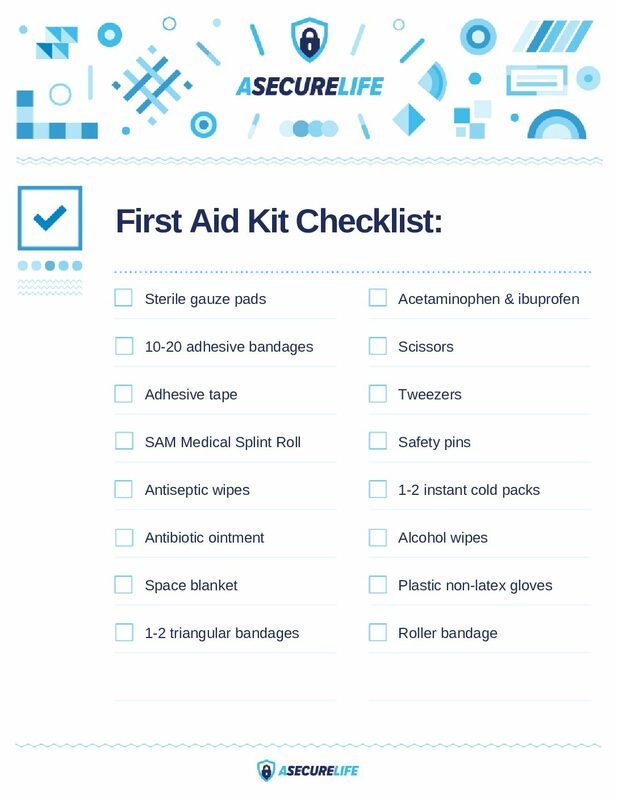 To help you get organized, download our printable checklist of everything you need for your first aid kit. What items do you consider essential in your first aid kits? Is there anything we’ve left off our list? Comment below to share your experiences.